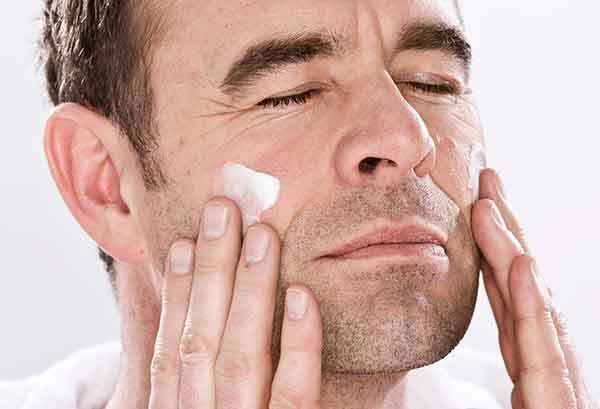 Read why choosing the correct grooming products for men is vital for your skin care regime. Being a male and in the cosmetic medical industry I need to take care of my skin and appearance. Most of us assume that skin care is different for men and women either because we believe that our skins are different and behave in different ways or that men do not take care of their skins or believe in the marketing that men should only use male specific products. In fact irrespective of age and gender we should have a basic skin regime that includes a cleanser for your specific skin type and beneficial active ingredients such as Vitamin C, resveratrol, BHA, and AHA. Furthermore I do believe that men do want to look good for their age and that they do want to take care of their skins. Why shouldn’t men also have clear pigment free complexions and have skins that glow? Looking at my skin care regime above one can see it does not include a whole host of products or steps or so called male skin products so my aim in this article is to highlight some basic necessities when it comes to male skin care, grooming and what vital ingredients/products to look out for. Choose products that help your skin with grooming such as shaving, calming the skin, reducing irritations, and preventing razer burns or rashes and ingrown hairs. Use products for your specific skin type: use my helpful guide to find your skin type here. This should be the number one step in any skin care regime including for all men. Yes I know I sound like a stuck record but without adequate and effective sunscreen then no matter what we place on our skins will go to waste. The biggest culprit we have for red sensitive skin, pores, pigmentation and ageing is UV damage. Use a SPF 30 or higher that contains zinc oxide and/or titanium dioxide every day even if it is overcast. HELIOCARE 360 GEL OIL FREE. See our full list of sunscreens here. This is a vital step and often overlooked by men. Does any of this sound familiar? ‘I wash my face in the shower’, ‘I’ll just splash some water on my face’ or ‘I’ll just use some soap’ if so then read on. A good cleanser gets rid of dirt and helps to prepare the skin for grooming and for skin care products including your sunscreen. This is your next important step after getting a good sunscreen. Bar soaps tend to strip the skin of natural oils and cause damage to the skin’s natural barrier and pH level. This is a light gel cleanser which has a foaming effect when rubbed on the skin and is suitable for all skin types. This cleanser has a moisturising effect while cleansing so is best for men who suffer from dry skin. It also helps to get the face ready for shaving without leaving a tight or dry effect. Most men can get away from using a moisturiser during the day if the serums mentioned below give adequate hydration. However at night my advice is to look for a moisturiser that has ingredients to help repair the skin from the day’s environmental assaults. These serums have a non-greasy feel and are easily absorbed into the skin after shaving to help reduce redness and irritation. You can effectively treat breakouts, ingrown hairs and redness or inflammation seen after shaving with salicylic acid (BHA) based products. These products work to help smooth out rough or bumpy skin and the salicylic acid also helps to reduce oiliness and/or pores. The best time to shave is immediately following your shower as washing your face with warm to hot water will help soften the hairs which will make your shave smoother and less irritating. Apply a gentle shave gel. Use a clean fresh razor and shave with the direction of your hair growth. I hope you found the above article valuable and that it will help motivate you to add proper skin products and ingredients to your skin care regime. Please feel free to send me any comments or questions on skin products and skin regimes.